Effectively Traces and Identifies cables on inactive and active network cables on HUB or Switch and Live or dead phone line systems. The PR-606 is designed specifically for locating and tracing cables on active networks and live phone lines. Today’s media networks have a combination of twisted pair data, telephone, coax and security/alarm wiring. It provides 2 selectable powerful tones allows cabling installers, Datacom/Telecom technicians directly plug into on non-active and active networks, patch panel, wall port or live or dead phone line, makes it easy to quickly isolate the right cable in the equipment closet, and locating an unlabeled network during installation and troubleshooting. It also tests cable continuity and can determine Line 1 and Line 2 polarity and voltage, as well as supply talk battery power to allow communication over inactive test sets. Built-in RJ45 plug cable is for tracing inactive and active LAN cable on HUB/Switch. RJ11 plug cable is for tracing live phone line and verify Line 1 & Line 2 polarity. Alligator clips for testing wire continuity and toning on non-terminated cables or punch down blocks and for connection to supply talk battery power. 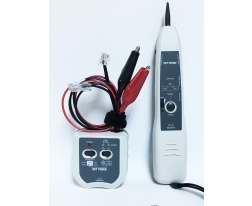 The Net Probe comes with adjustable volume control and Ring/Tip polarity test indicators, an earphone jack for noisy environments, low battery indicator, easy tip replacement, and lanyards attachment point for hand-free operation. The Net Probe is also equipped with a visual signal indicator. 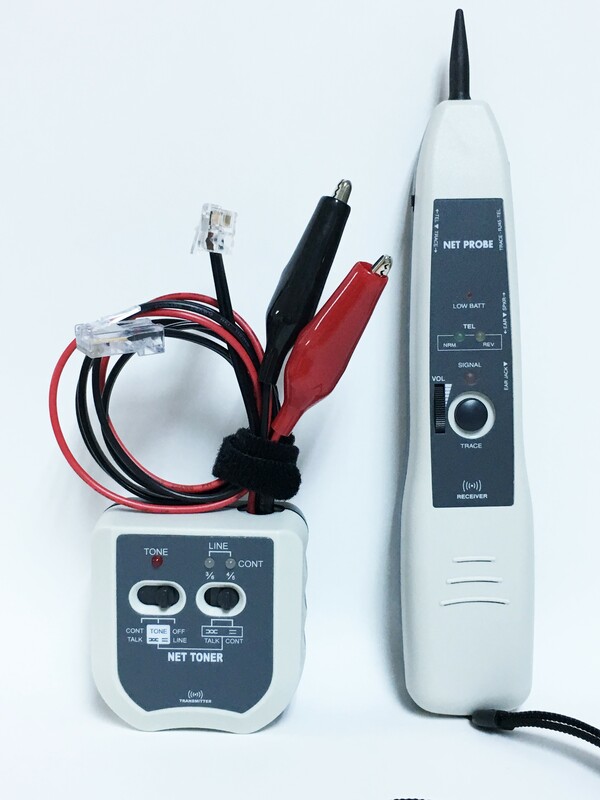 When used in conjunction with the toner, the Net Probe allows you to trace and troubleshoot Telecom/Datacom, Security/Alarm, CATV and Audio cable systems. This Kit is a must-have tool for installation, service and repair. Provides 2 selectable powerful tones for tracing active and inactive cables & wires. More effectively trace cables on HUB/Switch, patch panel, termination blocks or hidden within bundles. Allows quickly and accurately solve active LAN and live phone cabling installation and troubleshooting jobs. Verifies wire/cable continuity, detects short or open circuits. Determines telephone Line 1(4/5) and Line 2(3/6) voltage & polarity. Built-in RJ45 plug cable for tracing both active and inactive LAN network cables. Built-in RJ11 plug cable for tracing live phone line and verifies Line 1 & Line 2 polarity. Alligator clips for testing cable continuity, toning on non-terminated cables and for connection to supply talk battery power. Comes with adjustable table volume control. Includes Ring/Tip polarity indicators and RJ45 jack. An earphone jack for noisy environments. With low-battery indicator and easy tip replacement. Lanyards attachment point for hand-free operation. Generates Tones, Checks Wires Continuity, Provides Talk Power, Checks Lines Polarity. Slide Switch and LED Indicators – Tones, Line, Cont, Talk. 2.5" x 2.4" x 1.4"
8.3" x 1.55" x 1.08"